As we approached Moab, the hills started to crag and turn red. Three days and 1,500 miles later, we finally turned the last corner to arrive just after sunset to the Motos in Moab campground. 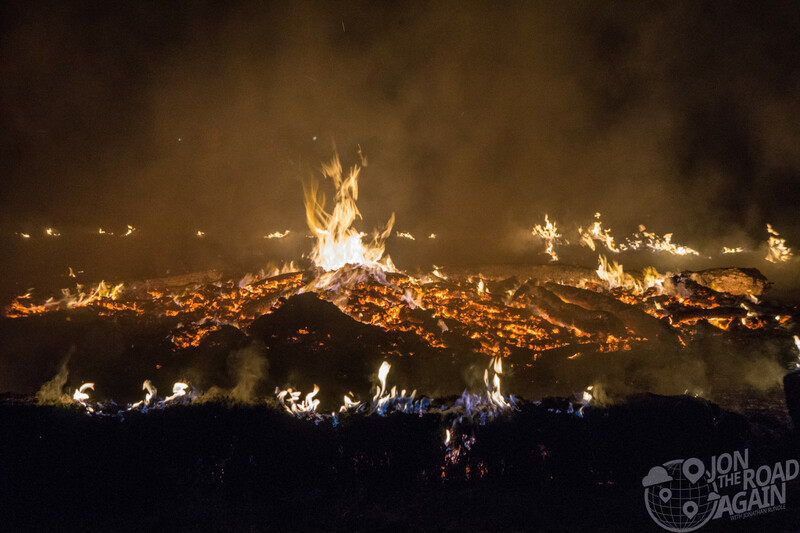 A sense of accomplishment, excitement, and belonging washed over me when we finished snaking our way through the canyon and saw the hordes of people hanging out around a massive bonfire. This is the party we crossed four states to get to. Rustin popped a wheelie and threw a fist in the air. First things first, we needed to set up home for the next three days. The Seattle crew rolled in pretty deep and we met up with a group that had trailered their bikes down and a guy who took a really great long-way-round down the California coast from Seattle to Moab. 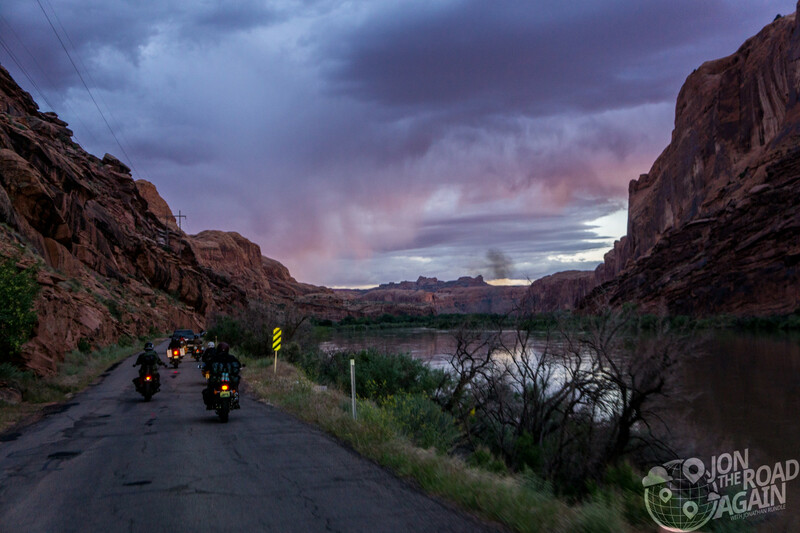 Unfortunately these other riders could only come down for the weekend and weren’t able to join the second leg of the “Utah Grand Tour” to Zion and Bonneville. Anyway, once we all spread out our camping supplies, we walked over to the bonfire where riders were racing each other in circles. There was a Dirt Quake feel in the air of people just letting loose—happy to be where they belonged, with all their camping stuff off their bikes, free to get wild and have fun. Oddly, the organizers hadn’t arranged for any alcohol to be sold on site, so we were glad to have picked up beers on the way in. The Moab convenience stores did pretty well that weekend, I’m sure. Jonny Buzzkill over here shoved his earplugs in at midnight and went to sleep in order to hit the road early and see the National Parks. The wild times at the campground mostly happened while I was still out riding for the day. I do admit that it was so damn hot I rode from the parks to the camp in hiking boots, a t-shirt and (gasp) shorts. The ATGATT’er in me took a couple of days off. Although, at least I kept my helmet on—not necessary in Utah. We met some cool people, like a fellow Tiger rider from Queens, NY who had flown in, rented in Denver and rode over. Other cool people from Seattle we hadn’t previously known were met, too. We also chatted with a lovely young lady who smuggled drugs in her hoo-hah to get through airport security, and another nice young man who sells custom guns and lost a fight with a shed. 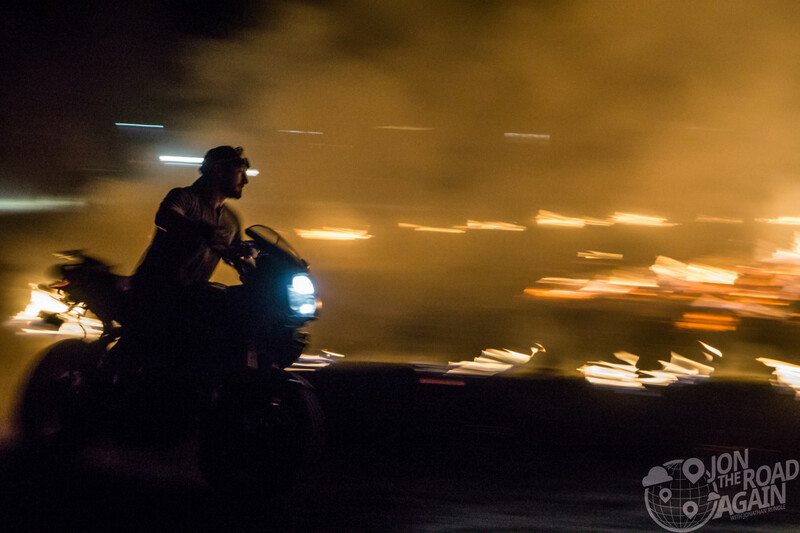 The personalities of Motos in Moab is what makes it a memorable experience. I blame the lack of photos on the fact that I was only at the campsite at night and my night photo skills are poor. Also, I took about 500 photos in Arches and Canyonlands, so pardon me if I suffered a little photo-burnout by the time I got back to camp. Anyway, to the rescue, Doug Lyon‘s photos are so much better than mine, so have a look and go follow him on Instagram! 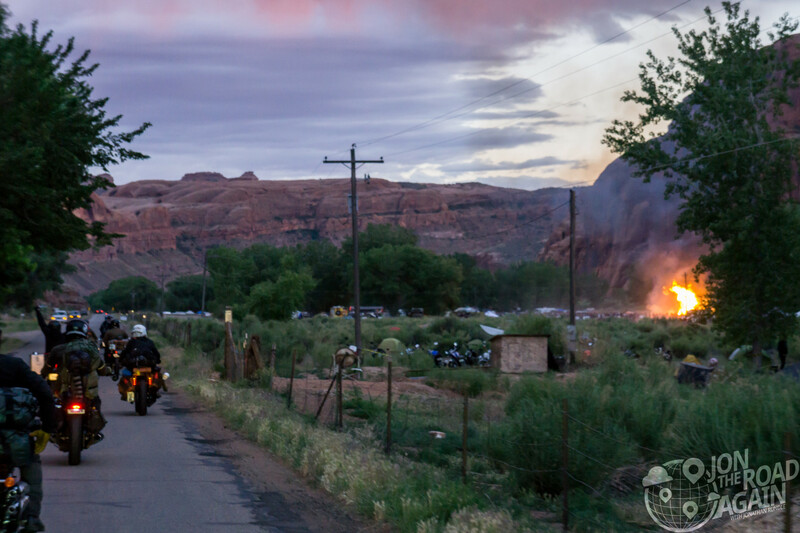 2016 is year #2 for Motos in Moab. The next iteration won’t be until 2018. If you’re up for it, check out their official website. Next we’ll explore the National Parks nearby, Canyonlands (both Island in the Sky and The Needles) and Arches National Park.